Not something you see every day: Team USA's Madison Kocian on the uneven bars. Might as well call them the even bars. China’s Fan Yilin, Russia’s Viktoria Komova and Daria Spiridonova and Madison Kocian of the U.S. made history on Saturday at the world gymnastics championships, tying for gold in the uneven bars when the judges awarded each the same score. There are no tiebreakers during world meets, meaning all four shared the top of the podium in one of the more unusual award ceremonies in the 112-year history of the event. "Guess they couldn’t decide which routine was the best," Kocian said with a laugh. "I don’t know." Neither, apparently, did the six-person judging panel. While there was a five-way tie for silver on pommel horse at the 1922 worlds, this is the first time the gold medal stand looked like a line at Starbucks. Organizers were forced to improvise during the ceremony, with the flags of all three countries being walked out onto the floor rather than being raised to the rafters because the rigging couldn’t accommodate four flags hanging from the same height. Crowded at the top: USA’s Madison Kocian, Russia’s Daria Spiridonova and Viktoria Komova and China’s Yilin Fan all won gold in the uneven bars. The Chinese, Russian and U.S. national anthems were played one after the other, with the athletes kind of giggling in a moment that was equal parts weird, awkward and memorable. "It’s very good," Russian coach Andrei Rodionenko said. "Not everything is understandable." Scores in gymnastics are comprised of two elements, one based on the difficulty of your routine and the other on how well you do it. Fan’s set was the toughest, even though her coach always seemed to be within arm’s reach in case of disaster. Kocian and Komova earned the best marks for execution. In the end, the total is the only thing that mattered, even if in this case it made things a little weird. OK, a lot weird. "I’ve never seen that before," said reigning Olympic champion Gabby Douglas, who finished fifth. "I was just like really judges? Come on now!" U.S. national team coordinator Martha Karolyi was just fine with the decision to spread it around, pointing to the pain that came in London three years ago when Aly Raisman lost a bronze in the all-around to Russia’s Aliya Mustafina on a tiebreak. There will be no tiebreakers at the Rio Olympics next summer. The supersized podium also put Kocian and Komova in close quarters just days after Komova — the silver medalist in the all-around behind Douglas in London — accused the U.S. team of being on performance enhancing drugs after the Russians were a distant fourth to the Americans in the women’s team final. Komova approached Kocian and three-time all-around champion Simone Biles in training on Friday to clear things up, a move Kocian considered sincere. "She said, `I’m truly sorry for what I said,’" Kocian said. "I guess we take it as a good thing because we’ve been dominating for so many years now." Detente appeared to have been reached by the time the women were on the stand together. "Either way I figured I would get a medal," Kocian said. "I was just hoping it would still be gold." There was also a tie for bronze in men’s pommel, though just more traditional two-way variety as Armenia’s Harutyun Merdinyan and Japan’s Kazuma Kaya each earned a medal behind British stars Max Whitlock and Louis Smith. Whitlock’s gold was the first ever by a male British gymnast at worlds. Whitlock’s score of 16.133 was a tenth better than Smith’s total as Britain continued its ascension to the sport’s elite. The British men won silver in the team finals on Wednesday, a day after the women earned bronze. Whitlock also picked up a silver on floor exercise behind Japan’s Kenzo Shirai, who added second world floor exercise gold to go with the one he captured in 2013. Spain’s Rayderley Zapata Santana edged China’s Deng Shudi for third. 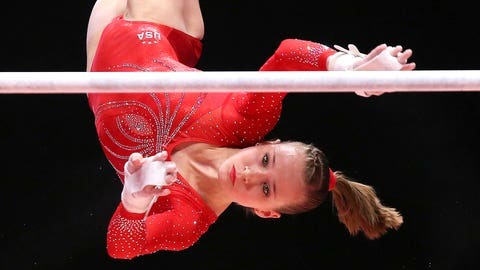 Russian Maria Paseka earned her country’s first medal of the championships on vault, where her average of 15.633 was just better than the Hong Un Jong of North Korea. Biles fought through spasms in her shoulder to claim bronze, her 12th career medal at the world championships, a record for an American woman. Biles actually had the top execution score on both of her vaults, but the difficulty of her second vault wasn’t high enough to pass Paseka or Jong. Biles is working on a harder second vault, but it wasn’t ready for the meet. She plans to correct that for Rio. The 18-year-old will get a chance to add to her haul during the balance beam and women’s floor exercise finals on Sunday. American men Alex Naddour finished seven in the pommel horse. Brandon Wynn was fifth on still rings behind gold medalist Eleftherios Petrounias of Greece, while U.S. teammate Donnell Whittenburg came in eighth.